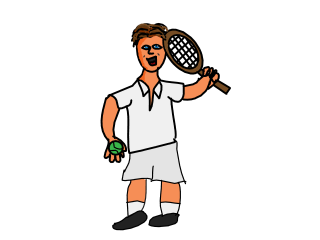 Welcome To Our Tennis Rules Page! *This will take you to Another Sporting Central Tennis Page and not out of our secure site. This game is for two people. Opponents stand at opposite ends of the Tennis court and hit the ball back an forth over a 3 foot high net in the middle. The Ball must go straight over the net without hitting the players own side. If the ball then bounces more than once on the other side then the player wins the point. 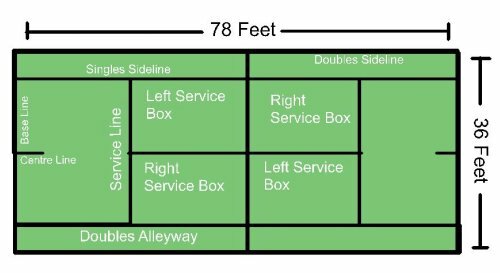 The Lines on the court show boundaries which form boxes such as the service area, service box and doubles alleyway. The Doubles Alleyway is an out of bounds area in Singles to decrease the amount of space a player has to cover. When a Ball hits the line it is considered as in but if the ball hits anywhere outside the line. Always serve diagonally starting each game on the right. You can serve anywhere in the service box at any speed with any spin. If the ball goes out once it called a fault and you get a second serve, however, if this one goes out too then the point goes to your opponent. A let is when the ball touches the net on a serve yet still goes over and into the service box. How many Lets in Tennis? You get as many lets as you want as long as the ball hits the net and goes over the other side. After one game the other player will then serve etc. A coin is tossed and the person who wins get to decide if they wish to serve first or not and the other player decides which end they will start playing from. Tennis Rules State that you can play either a best of 5 sets or best of 3 sets match. In big tournaments women play 3 set matches and men play 5 set matches but they can go on for hours so it is purely your choice. Of course you could just play one or two sets if you are practising. It is the first player to get 6 games with a two game lead, for example 6-4 would win a set but 6-5 would not. If the score gets to 6-6 there is what is known as a tie-break, which is the first player to get 7 points with a two point lead. In the final set of a match (either the 3rd set or 5th set) there is no tie-break so the players would keep going until one of them wins with a two game lead. Games make up a set. -Both players start at love (which is zero points). -The first point is 15, second point 30, third point 40 and then game. -If both players get 40 it is called deuce and then from deuce the next player to win a point gets advantage and then game. -However, if one player gets advantage then looses the point it must go back to deuce and then both players are fighting for advantage again. Opponents stand on opposite ends of the court. This game is for 4 people but is made up of two teams of two, and can either be 4 people of the same gender or one person of each gender per team, this is known as mixed doubles. The Tennis Rules for Doubles are the same as in singles. If you are playing mixed doubles or women’s doubles you play 3 sets if it is men’s doubles you play 5 sets. Tennis Rules For serving are slightly different in Doubles. You simply take it in turns, 1 person from one team will serve for one game then it is the next team’s turn then the other person in the team serves, it keeps going round like that throughout the game so that everyone serves. In terms of splitting up one side of the court between two people, the two main techniques are: 1 player covers the front of the court and one covers the back, or one player takes the left side of the court and one player takes the right. In Doubles is where the Doubles Alleyway is used. Got it? Know your Tennis Rules? Great! Now find out where to play! Click here to visit our interactive Tennis Court Finder!